If you have ever heard of, or, experienced the last four Eisa Festivals at Kapiolani Community College in the past years, then you know why the popularity of this dynamic annual production has grown. On Sunday, July 12th, you better hold on to your bentos, because the 5th Annual Eisa Festival, entitled “Drums of Hope” will blow you away! The theme of this presentation will demonstrate how culture can provide a light to cast on the darkest of times. Great tragedies often birth great love and a coming together of communities, prefectures, and even countries around the world. The survivors of the 2011 Fukushima earthquake are still in need of your kokua. 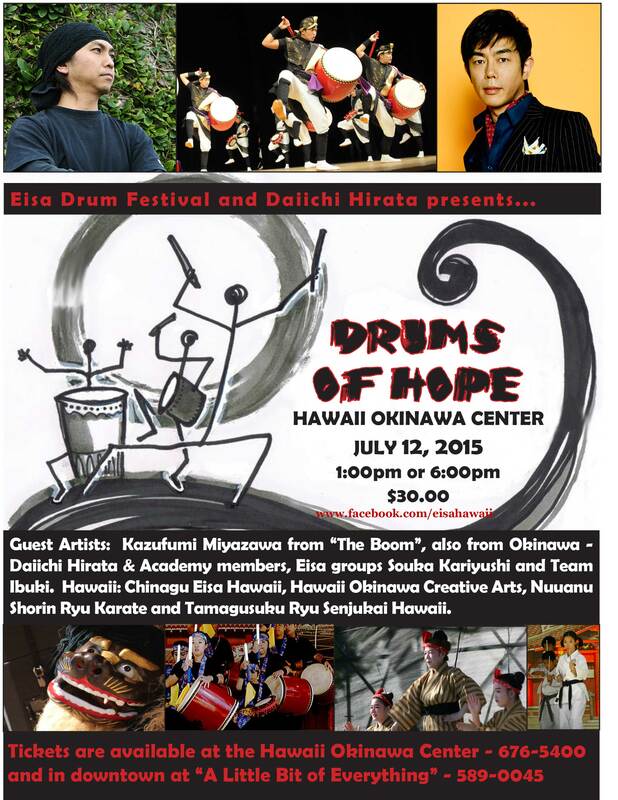 Part of the proceeds from “Drums of Hope” will support the Hawaii United Okinawa Association and the Fukushima Relief Effort. Together drummers, chanters, singers, dancers, and martial artists from Hawaii, Okinawa, and Fukushima will form a powerful force of drums and hearts beating together. Returning all the way from Okinawa will be the acclaimed artist and director Daiichi Hirata, known for his explosive choreography that is most appropriately described as “magical,” as well as, a special performance by Kazufumi Miyazawa, lead singer of The Boom! known by many for their hit song Shima Uta. Hawaii performers include Chinagu Eisa Hawaii, Hawaii Okinawa Creative Arts, Nuuanu Shorin Ryu Karate and Tamagusuku Ryu Senju Kai Hawaii and, a special guest, Halau Hula Ka No’eau lead by Kumu Michael Pili Pang. From Okinawa, Daiichi Hirata and members of his academy and Souka Kariyushi. Finally, representing Fukushima is Team Ibuki. Get ready for a EUPHORIC THUNDERSTORM called DRUMS OF HOPE! When: Sunday, July 12, 2015 @ 1:00 p.m. and 6:00 p.m.
Tickets are sold at the Hawaii Okinawa Center (676-5400) and A Little Bit of Everything (589-0044).